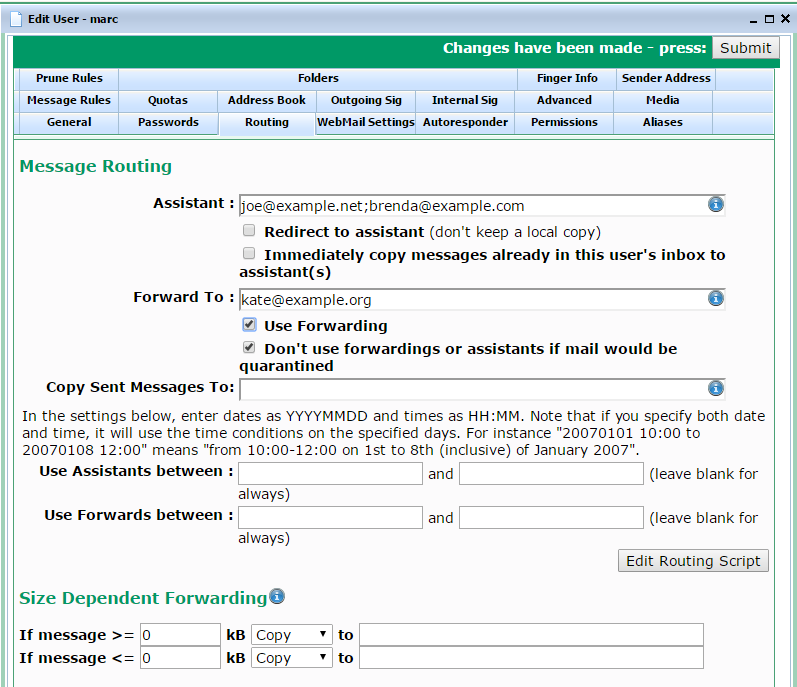 The user's Routing tab lets you set the how incoming messages will be handled - eg message forwarding. The Assistant is a list of email addresses to whom incoming messages to this mailbox will be copied (unless Redirect to assistant is checked). You can specify multiple assistants by separating their email addresses with a semicolon. If the assistant is another local VPOP3 user, you can just specify the user name; you don't need to specify the full email address (the full address will still work). Also, if the message is coming FROM one of the Assistant addresses, then VPOP3 will ignore the Assistant setting. This is deliberate functionality. This is so that, for instance, you can set Joe to be the Assistant for Kate, and have incoming messages for Kate redirected to Joe. So, all messages addressed to Kate can be checked by Joe first. Then, if Joe forwards a message on to Kate, VPOP3 will see that the message is coming from the Assistant, so will not redirect it back to Joe, but will let the message be delivered to Kate. Also, note that if the Assistant also has an Assistant defined, the message will be sent to the Assistant, but not to the Assistant's Assistant (this is to try to avoid unexpected loops or message 'explosions'). Usually the Assistant function will send a copy of the message to the specified address(es). However, if the Redirect to assistant box is checked, then VPOP3 will redirect the message to the Assistant(s) and this user will not receive a copy of the message. If the Immediately copy messages already in this user's inbox to assistant(s) box is checked, then VPOP3 will immediately copy any messages in this user's inbox to any local assistants specified. (The setting in this box is not remembered, so must be checked to cause this action). This can be useful if you set the assistant 'too late' and some messages have already been received by the user but weren't copied or redirected to the assistant. The Forward To is a list of email addresses to whom incoming messages must be redirected. You can specify multiple assistants by separating their email addresses with a semicolon. If the assistant is another local VPOP3 user, you can just specify the user name; you don't need to specify the full email address (the full address will still work). If you have a Forward To address set, then this user will not receive a copy of the message as well, the messages will only be forwarded. You can use the Assistant and Forward To options together, but you cannot use the Redirect to assistant option with Forward To. The Use Forwarding box lets you enable/disable the Forward To addresses in one step. This means the addresses do not have to be deleted (and possibly forgotten) if you want to temporarily disable forwarding. The Don't use forwardings or assistants if mail would be quarantined box lets you tell VPOP3 that if the message would be quarantined it should not be forwarded. If this box is not checked, then potential spam will be forwarded along with other mail. If the target users are local VPOP3 users, then the spam messages will be placed into the target users' spam quarantines, but if the target users are not local VPOP3 users, the spam messages will be forwarded to them. This may make the mail server for the remote users think that VPOP3 is sending spam, so it may restrict or block it from sending mail. If this box is checked, then VPOP3 will place the potential spam in this user's spam quarantine, and it won't be forwarded at all. 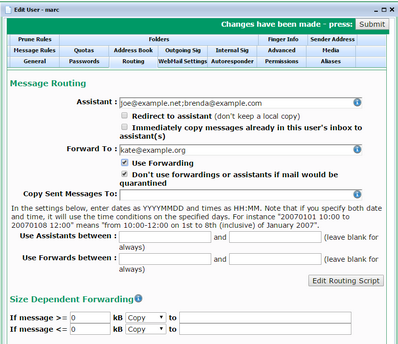 The Copy Sent Messages To setting lets you specify addresses to whom messages sent by this user should be copied (BCCd). You can specify multiple addresses by separating them with semicolons. If you want to use this option your users should use SMTP authentication when sending messages. The next section is actually handled by the Routing script. By default a basic routing script is installed. The script can be changed to change how the settings are presented and how they behave. The description below is for the default routing script. If it is different for you, then you may have a different routing script. The Use Assistants between and Use Forwards between settings let you specify the times and dates when the Assistant and Forward To settings will apply. Specify any dates as YYYYMMDD and times as HH:MM (24 hour clock server local time). For instance, you could specify 12:00 for a time or 20161013 for a date or 20161013 12:00 for a date and time. If you specify both date and time, then the script treats them separately, so 20161013 12:00 to 20161017 15:00 means from 12 noon until 3pm on 13th, 14th, 15th, 16th and 17th October; it does not mean from 12 noon on 13 October until 3pm on 17 October. Size Dependent forwarding lets you configure forwarding rules depending on the size of the message. The first one lets you specify that if a message is larger than a certain size it can be copied or redirected to specified email addresses (separate multiple addresses with semicolons). The second one lets you specify that if a message is smaller than a certain size it can be copied or redirected. To disable an option simply set the size to 0 or the target addresses to blank. Forwarding and Assistants from VPOP3 do NOT change the recipient and sender addresses in the message headers. The message will still appear to be from the original sender, and to the original recipient. This can occasionally cause confusion where someone may be uncertain why they received a particular message. The Message Trace function may help establish why the message was received in this case.